Bijoux Blooms are works of art “germinated” (handmade) by artist and designer, Adrienne Robineau, owner of Isabel Bay Design, in Port Townsend, Washington. They are made from re-purposed glass and/or ceramic ware acquired from Northwest thrift stores. These purchases turn into donations for charitable organizations to run aid programs in our local communities. 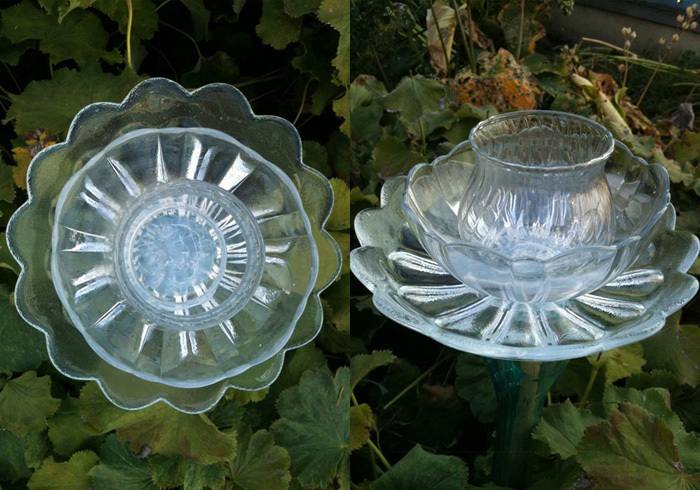 Bijoux Blooms are comprised of artfully stacked glass/ceramic ware glued together with exterior-grade 100% silicone to make flower-inspired garden art. The bottom of blooms are glued to an inverted glass vase which creates a “stem” to allow blooms to be installed over a metal stake (recommended) or a painted wooden dowel. Using a rubber mallet or hammer, point the angled-end of the stake down and drive it vertically into ground until firmly embedded. Carefully lower glass flower stem over stake. Adjust placement and height of stake until desired effect is achieved. Lighter weight Bijoux Blooms can be installed at a slight angle if preferred. The glass stem may or may not touch the ground. Just be sure the stake is firmly installed and the glass bloom is well supported. In your garden, Bijoux Blooms can stand out as a focal point or nestle into existing plants and shrubs to blend in with your landscape design. Bijoux Blooms can stand alone as one-of-a-kind art pieces, be group together to create a greater impact or with some designs, function as garden path lighting. Most Bijoux Blooms are one-of-a-kind designs, though when I find multiple identical glass pieces, bloom designs can be easily duplicated. Some Bijoux Bloom designs come in twin, triplet and quadruplet sets! Adorning your garden with these sets can help create a theme and visual cohesion. 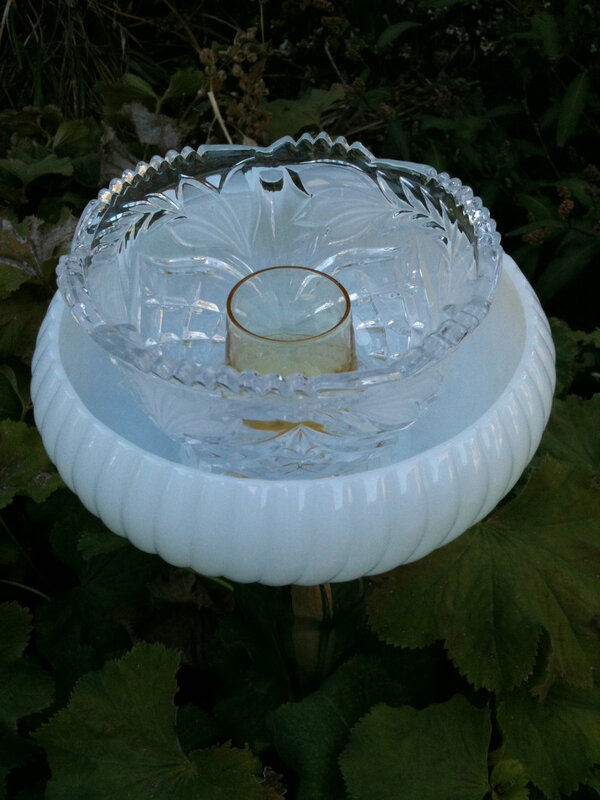 Some Bijoux Blooms are designed to hold solar or battery-operated lights or traditional tea light, votive, taper or pillar candles. 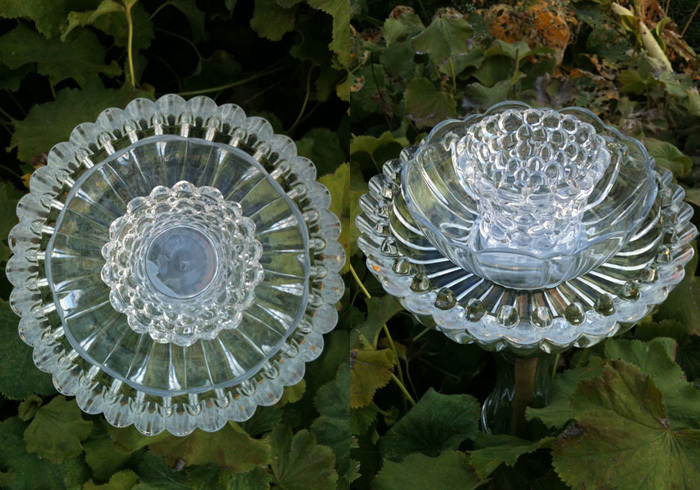 Candle holder blooms come both stemmed and unstemmed. Stemmed candle holders can be placed over a painted wooden dowels I provide and can be used for soft lighting in your garden or pathway. Unstemmed candle holders may be placed on a table, the ground or stable surface away from children, pets and flammable objects. Be sure to protect surfaces from heat. Do not handle or wash glass when hot. Do not leave candle unattended. Bijoux Blooms come in many sizes: mini, small, medium, large and extra large. Smaller sizes can be used indoors or in planters. Larger blooms are impressive and can help to define your garden design. Glass colors used include clear, red, blue, teal, pink, yellow, amber, amethyst, green, orange, brown, black and milk. Ceramic pieces come in all colors of course but I mostly use white. Check your blooms from time to time, being sure the stake is still well installed, remove any plant debris, and pour out rain water if necessary. If it's dirty, you may hand wash it with water, dish soap and sponge or hose off gently while holding bloom steady, Most blooms will tolerate being run through a dishwasher, but be sure to put it on a delicate or China setting and either wipe or air dry (no heat drying.) There may be some blooms that won't do well in the dishwasher--use your best judgment or email me. Below 35° temperature, bring indoors!! !